While Donald Duck is my personal favorite Disney character, one of my favorite Mickey cartoons was the Sorcerer’s Apprentice short featured in the seminal 1940s classic Fantasia. One of the most disappointing things about Disney Infinity is the complete lack of classic, well, Disney franchises. It’s great that we can run around Monsters University, or sail the seas in Pirates of the Caribbean, there has been a noticeable dearth of Mickey Mouse, Pinocchio, Sleeping Beauty and many other memorable quintessential Disney characters. Soon, that all changes. On Sunday, February 9th, the Sorcerer’s Apprentice Mickey figure will be made available at retail stores nationwide. While there isn’t an additional Playset to go along with it (sadly), you’ll be able to run around your own created Toy Box levels either solo or with your friends, and sling magic at each of your foes. You will get another Toy Box Adventure though. This little sidescrolling minigame is called “Mickey’s Magical Escape,” and will pit you against a bunch of animated brooms as you try and escape the castle in record time. It’s unfortunate that there isn’t a whole epic adventure to go along with Mickey like the other major Playsets, but it’s better than nothing. 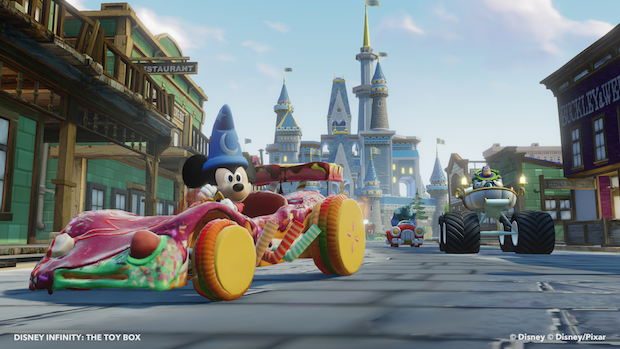 If you’re looking for an opportunity to run around Disney Infinity as the iconic mouse, then you won’t be disappointed. And hopefully, this means we’ll get some more classics on the way. Sorcerer’s Apprentice Mickey hits retail on February 9th for $12.99, and is compatible with all versions of Disney Infinity.